Mick McCarthy speaks to the media at Victoria Stadium, Gibraltar ahead of tomorrow's Euro 2020 qualifier. IT’S FINALLY TIME to get down to work. 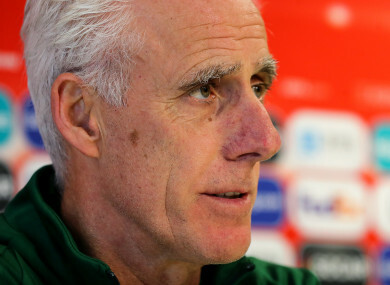 “I’m sick of talking about it”, affirmed Mick McCarthy at his pre-match press conference ahead of tomorrow’s Euro 2020 qualifier with Gibraltar. “I’m just looking forward to getting playing now. It’s been four months, I’ve been everywhere, I’ve spoken to everyone. If the lead-in to tomorrow’s kick-off has seemed long, it comes after a torturously long 2018. The stats are well-established at this stage: nine games, one win, four goals, no craic. “The lads realise that last year wasn’t good enough”, admitted Seamus Coleman. “At the same time, the new lads coming in, you don’t want to tie them down with that baggage. Let them come in and be excited to be called up. to play for our country. So how to freshen things up? McCarthy has brought in some new faces – James Collins, Josh Cullen, Mark Travers, and Jack Byrne weren’t capped by Martin O’Neill, although Byrne was involved with a camp before Euro 2016 – but the most significant additions in this respect have been he and his coaching staff. Coleman spoke of the positivity in the camp and the keenness of the players to make an impression, with McCarthy admitting that some players’ intensity at the beginning of the week was a little over the top. The biggest issue to correct from last year is the goalscoring problem. The senior squad didn’t even score enough to warrant a shortlist at the recent awards ceremony – the Goal of the Year award was tweaked to include goals scored at all levels – and an injury to Shane Long has left McCarthy with four strikers who have just 14 caps and a single goal between them. McCarthy revealed some of the work done on the training ground to try and improve the problem. “The first training session, I wasn’t happy with the amount of chances that we were creating, or players getting in the box. TC [assistant Terry Connor] put a great session on exactly for that, on the third day, and we gave them the feedback on the night, just to showed the difference between how you can do it. “We’ve got to do it in a game, of course, doing it in training is one thing. We have worked on it, and that’s pretty much all you can do; give players information in terms of wanting people to get in the box, putting crosses in the box, however you get in there. “Just try and create more chances and have more bodies there, on the move, and trying to score if we create we chances, and hopefully we do. One further break from the past may be involvement of Robbie Brady, generally seen as undroppable from O’Neill teams when fit. He has struggled for game time with Burnley of late, however, and has completed 90 minutes just twice all season. Given that McCarthy has accentuated the importance of regular game-time by cutting James McCarthy when narrowing down the provisional squad, Brady may not be seen as an automatic starter. The other big change from the O’Neill era will be when he informs the players of his team selection. That it was revealed shortly before kick-off earned the previous manager criticism, McCarthy said his players will know later tonight, although did joke he might email them during the night so it’s the first thing they wake up to. He insists that the conditions won’t be an issue; talk of the astroturf pitch receding and instead directed to speculating about the strong wind likely to batter the Victoria Stadium tomorrow evening. “You are aware where we play our football? We don’t play in ideal conditions all the time. Bear in mind that I started in Barnsley and moved to Sunderland and Glasgow. ‘Getting on with it’ being his soon-to-be-gratified desire. Email “Mick McCarthy reveals work to improve attack as Ireland bid to finally leave 2018 behind”. Feedback on “Mick McCarthy reveals work to improve attack as Ireland bid to finally leave 2018 behind”.